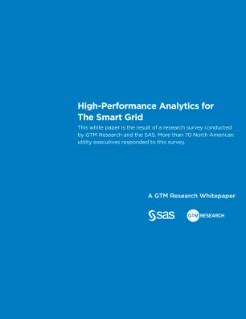 Smart grid technologies are creating vast new volumes of data – and opening up opportunities for utilities to modernize their operations through the use of high-performance analytics. But are utilities companies successfully making the move? Research by Greentech Media Research and SAS suggests that the journey has only just begun. More than 70 North American utility executives responded to a survey devised to gauge how utilities are defining, conceptualizing and understanding both big data and analytics. This white paper provides a detailed overview of the survey's findings and explores some of the barriers utilities face in both day-to-day use and enterprisewide adoption of analytics.